The purpose of your website is to serve your business goals and objectives. These likely include sales targets, increased readers and engagement, social sharing, and better search engine rankings. It’s important to document your specific goals and have the tools in place to monitor your success. During our discovery phase, we’ll help you compile a list of your website’s goals and measures of success. These will help guide the visual and technical decisions we make during design and development. If you have an existing website, we’ll ask for access to your Google Analytics account for baseline data. We’ll use this to understand your audience, see what’s working and what needs improvement. Before launching the site, we’ll review your list of goals / success metrics and setup tools & reports to monitor their performance over time. Here are some of the tools we’ll use to measure success. Google Analytics is a free marketing analytics tool for businesses to understand their customers and website performance. They provide an incredible breadth and depth of reporting to analyze every aspect of your site. It can be a bit overwhelming to use, but we can direct you towards the reports that matter. We can build more advanced reports for specific goals within Google Analytics. We’ll provide you direct links to these reports, and can schedule email summaries to be sent weekly or monthly. We’ll install and configure Monster Insights, which is the best way to integrate Google Analytics in WordPress. In addition to collecting GA data, it provides simple, easy to use reports in the backend of your WordPress website. 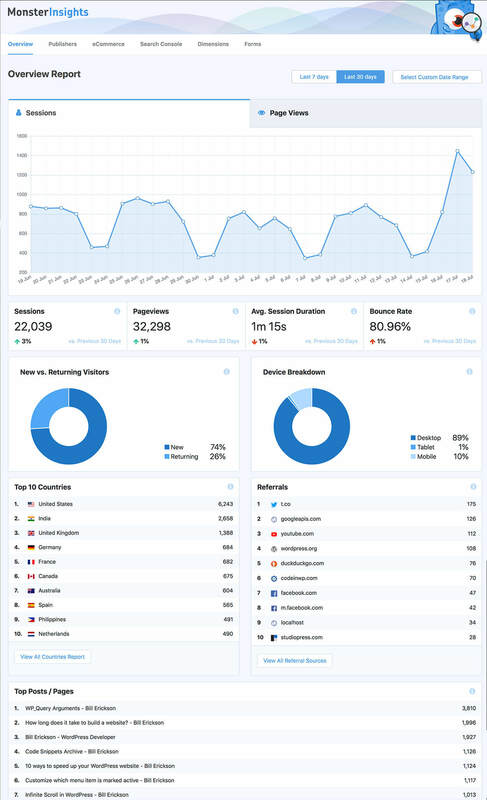 Monster Insights will provide an overview of your traffic and site usage. We can also implement custom performance tracking tools to monitor specific elements in your site. Google Search Console is a free tool to monitor and maintain your presence in Google’s search results. You can see what search terms lead visitors to your site, your clickthrough rate, and average position. It will notify you of any errors Google finds in your site while indexing it. Once set up and integrated, this data is also available in the “Search Console” tab of Monster Insights (see screenshot above). WP Rocket is a caching plugin that will keep your site loading as fast as possible. It takes care of many of my performance recommendations and has been optimized to work well with WPEngine, my recommended host. If one of the goals of your site is to encourage social sharing, we will use Shared Counts. It’s free, built to scale, very customizable, and has analytical tools built-in. We can display popular posts based on social sharing data, helping users find interesting content. When editing a post, you’ll see the breakdown of social shares across platforms (screenshot). The dashboard provides a listing of your most popular content (screenshot). And the plugin integrates with Google Analytics’ Social Interactions tracking, so you can monitor on-site social shares over time. We will use WPForms to build all forms on your site – contact forms, donation forms, newsletter signups, and more. It integrates directly with Monster Insights so we can monitor form conversions. If search is an important feature of your site, we’ll replace the standard WordPress search with SearchWP. It provides deep indexing of your content and the ability to customize the ranking factors. We also the Search Metrics report, which helps you understand what users are looking for, determine what new content should be created, and automatically optimize rankings based on click through rate (moving popular content to the top of search results). If we are displaying related content articles, we can use their Related Posts addon to leverage their relevancy engine to select related content.